Client: Desigual / Co-creation to understand and re-define the creative process of clothing. Workshop lead in collaboration with Ariel Guersenzvaig and Salva Fabregas. Part of the Elisava Innovation Lab. Subtle Bodies’ chess pieces are composed of two aromatique blends, that entwine to develop an unmatched atmosphere for supreme clarity and healing to unfold. Subtle Bodies has been crafted to harness the intense concentration of mind stimulation, to generate an inimitable spiritual practice to be experienced in duality. Light and dark, shadow and light, life and death. Exact opposition brings re ection, symmetry and balance. The purest harmony is achieved through acknowledging and accepting both sides. Client: Decathlon. Understanding our users. 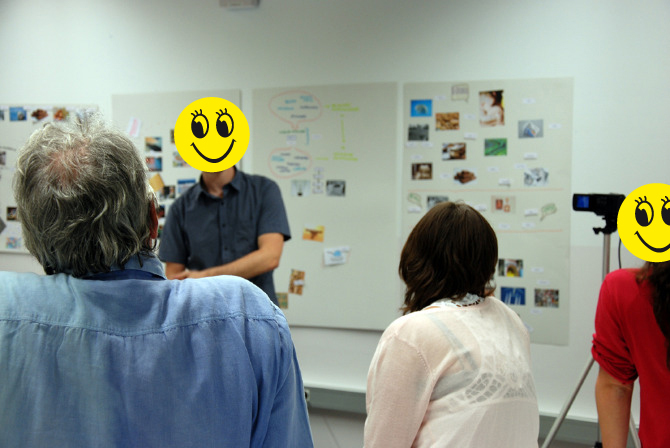 "Empathy maps" in group sessions. Madrid and Barcelona. The Future is Now: Co-creation in times of changes. Leading a workshop between people of 25 and 65 years old to understand the demographic in 2050. ¿Can we lead our acts due to interests not ages? ¿How can we share expertise between those two generations?